Not to be confused with United States Navy, one of the two armed services within the Department. The United States Department of the Navy (DoN) was established by an Act of Congress on April 30, 1798 (initiated by the recommendation of James McHenry), to provide a government organizational structure to the United States Navy, the United States Marine Corps (from 1834 onward) and, when directed by the President (or Congress during time of war), the United States Coast Guard, as a service within the Department of the Navy, though each remain independent service branches. The Department of the Navy was an Executive Department and the Secretary of the Navy was a member of the President's cabinet until 1949, when amendments to the National Security Act of 1947 changed the name of the National Military Establishment to the Department of Defense and made it an Executive Department. The Department of the Navy then became, along with the Department of the Army and Department of the Air Force, a Military Department within the Department of Defense: subject to the authority, direction and control of the Secretary of Defense. 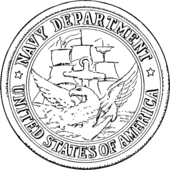 Seal of the U.S. Department of the Navy from 1879 to 1957. The Department of the Navy is headed by the Secretary of the Navy, also known as the SECNAV in naval jargon, who has the authority to conduct all of the affairs of the Department, subject to lawful authority, the Secretary of Defense, and the President. The Secretary of the Navy is appointed by the President with the advice and consent of the Senate. The Secretary is assisted by an Under Secretary of the Navy, four Assistant Secretaries of the Navy and a General Counsel of the Department of the Navy, who are also appointed by the President with the advice and consent of the Senate. The highest ranking military officers in the Department of the Navy are the Chief of Naval Operations and the Commandant of the Marine Corps, who are the principal military advisors to the Secretary of the Navy. They supervise their respective military services of the Department of the Navy, and in a separate capacity serve as members of the Joint Chiefs of Staff. They are assisted by a Vice Chief of Naval Operations and an Assistant Commandant of the Marine Corps. Unlike its U.S. Army and U.S. Air Force counterparts, the Department of the Navy comprises two uniformed services: the United States Navy and the United States Marine Corps (sometimes collectively called the "naval services" or "sea services"). The Department of the Navy consists of all elements of the United States Navy and the United States Marine Corps. According to Navy Regulations Section 0204-2, the term "Navy Department" refers only to the executive offices at the seat of government. The entire operating forces of the Navy (including naval aviation) and the Marine Corps, including both the active and reserve components (the Navy Reserve and Marine Corps Reserve) of those forces;. A provision in the initial House of Representatives bill (H.R. 1585) for the fiscal year 2008 national defense authorization would have renamed the Department of the Navy as the "Department of the Navy and Marine Corps". The bill passed in the House on 17 May 2007, but encountered opposition among members of the DoD civilian leadership and among senior Navy admirals and Marine Corps generals. In the Senate, the provision was replaced in S. Amdt. 2011, an amendment in the nature of a substitute proposed by Senator Carl Levin of Michigan on 9 July 2007 and agreed to by unanimous consent on 1 October 2007. The amendment removed the renaming provision and also made other changes. The House version including the provision was withdrawn in conference committee and so was not included in the final National Defense Authorization Act for Fiscal Year 2008. ^ Bernard C. Steiner and James McHenry, The life and correspondence of James McHenry (Cleveland: Burrows Brothers Co., 1907). ^ Chap. XXXV. 1 Stat. 553 from "A Century of Lawmaking for a New Nation: U. S. Congressional Documents and Debates, 1774 - 1875". Library of Congress, Law Library of Congress. Retrieved March 24, 2012. ^ 10 USC §5013 Archived 3 February 2011 at the Wayback Machine, Accessed on 2011-03-23. ^ See William A. Owens, High Seas: The Naval Passage to an Uncharted World (1995), Naval Institute Press, p. 100; Brent G. Filbert and Alan G. Kaufman, Naval Law: Justice and Procedure in the Sea Services (1998), Naval Institute Press; Brian R. Wolff and John Alexander, The U.S. Navy and Marine Corps Into the 21st Century (1997), Osprey, p. 7; Joseph H. Alexander and Merrill L. Bartlett, Sea Soldiers in the Cold War: Amphibious Warfare, 1945-1991 (1995), Naval Institute Press; p. 71, p. 175. ^ "H.R. 1585: National Defense Authorization Act for Fiscal Year 2008". Legislation: 2007-2008 (110th Congress). GovTrack.us. 17 May 2007. Retrieved 6 December 2016. ^ "S.Amdt. 2011: In the nature of a substitute". Legislation: 2007-2008 (110th Congress). GovTrack.us. Archived from the original on 15 September 2008. Retrieved 24 December 2007. United States Navy Regulations, Accessed on 2011-03-23. Wikisource has the text of a 1921 Collier's Encyclopedia article about United States Department of the Navy.